If you're following my instagram profile, you know that this week I'm in Nagano, Japan photographing the snow monkeys. It's an absolutely awesome location for a photographer, and the photos are turning out pretty cool. I wanted to share with you some information about the trip if you're considering coming down to Japan, and also some helpful tips for getting the best results. Millions of photographers around the world read Improve Photography, so I try and document the information I learn about each trip so that others can find it on Google and have more successful photography adventures. IMPORTANT TIP! Since publishing this article, we created the ULTIMATE tool for planning a photography trip to Japan. It's called Really Good Photo Spots. It's a free iPhone and iPad app with THOUSANDS of the best photo locations in the world all in one app. Nearly every country in the world has many spots. It's really convenient for travel photography because you can just tap “Spots near me” and BOOM! It lists all the best spots to take pictures near you. Download really Good Photo Spots for the iPhone or iPad right here. 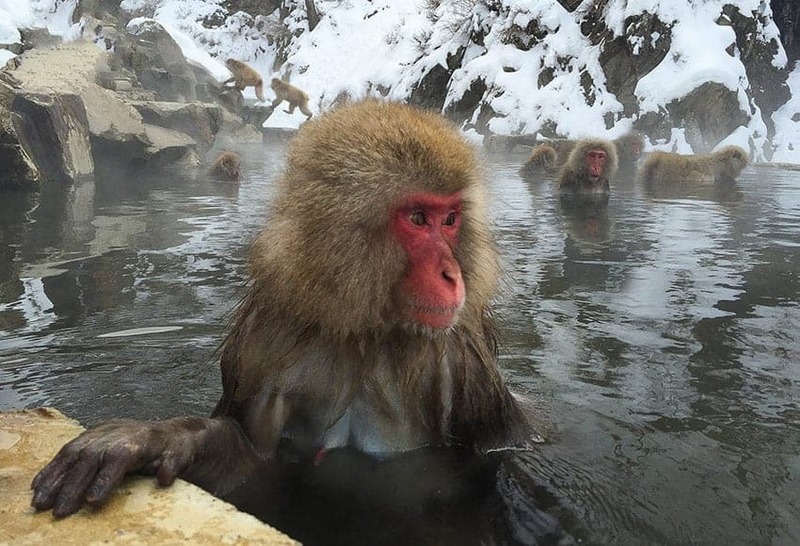 30 minutes outside of Nagano, up in the snow covered mountains during the winter, there is a small creek and pool of hot geothermal water called the Jigokudani snow monkey park. The monkeys come down from the trees each day to bathe in the hot pools. This makes for an epic photography location since the steam of the water, the snow around the pool, and the gorgeous monkeys can be photographed up close and personal. This is a popular photography destination because the photos turn out so cool. It's tough to take a BAD photo of these monkeys. The trip is relatively inexpensive to make (at least from the United States), and the winter is the best time to get the shot because of the snow on the ground and the monkeys wanting to be in the warm water. That's nice because it can be tough to find good photography locations during the winter in the northern hemisphere. At first while I was hiking in, there was a monkey on the trail and we stopped for a few minutes to take pictures. That was a bit of a mistake because I found later on the trail dozens of monkeys I could photograph that close. The monkeys are not at all afraid of humans. The epic shot of the monkeys is when it's in the hot pool. So I wouldn't waste too much time getting photos of the other monkeys out on the rocks and around the creek. Remember to include what's cool in the story, and the reason you're going to this location is to get the photos of the monkeys in the pool. If it's not snowing on the particular day when you visit, fear not. It's actually pretty easy to add snow in Photoshop to give the photo the mood of it actively snowing while you were taking the picture. Also, be sure to include at least some water in the photo or else the viewer who hasn't been to the hot pools won't know why the photo is so hazy. If you stand up next to the railing below the pool, you have a perfect view of where the monkeys jump from a higher rock out to a tiny little rock in the middle of the pool. I spent quite a bit of time trying to get that shot, but couldn't ever quite nail it. For me, I paid $900 on Expedia to get my flight from Boise to Tokyo AND my hotel in Nagano (great deal!!!). Then I took a train from Tokyo to Nagano which cost about $80. Then all I had to pay was small amounts for food and bus tickets while here. Entrance to the snow monkey park is only a few dollars. 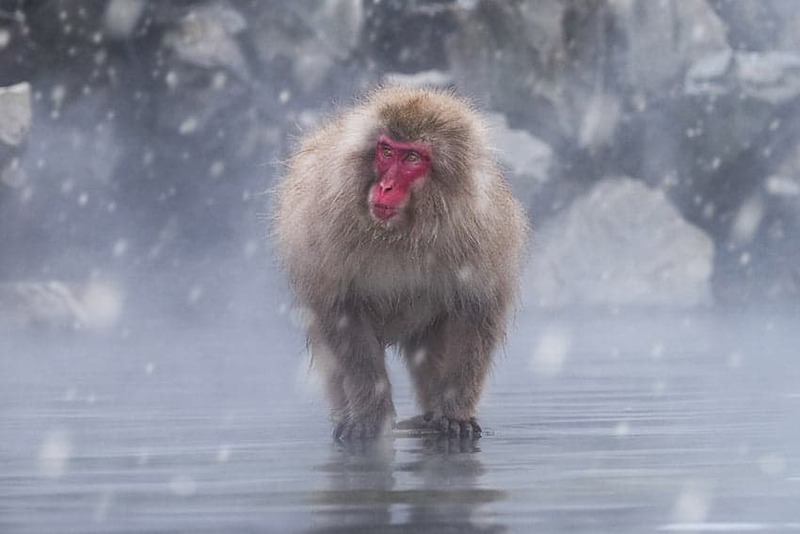 So for the cost of a full frame lens, you could take a trip to Japan to photograph snow monkeys for a week–all expenses paid. That's pretty darn cool. This is a pretty inexpensive trip. The other nice thing is that travel to Japan from the United States does not require a visa, which saves you some money and makes the planning process much shorter. I found that the cheapest time of year to get my ticket was in December before Christmas, and I traveled in February. I usually find that tickets to another country are cheapest about 10-12 weeks out from the trip. I would recommend you come prepared with your camera (obviously) and two lenses. 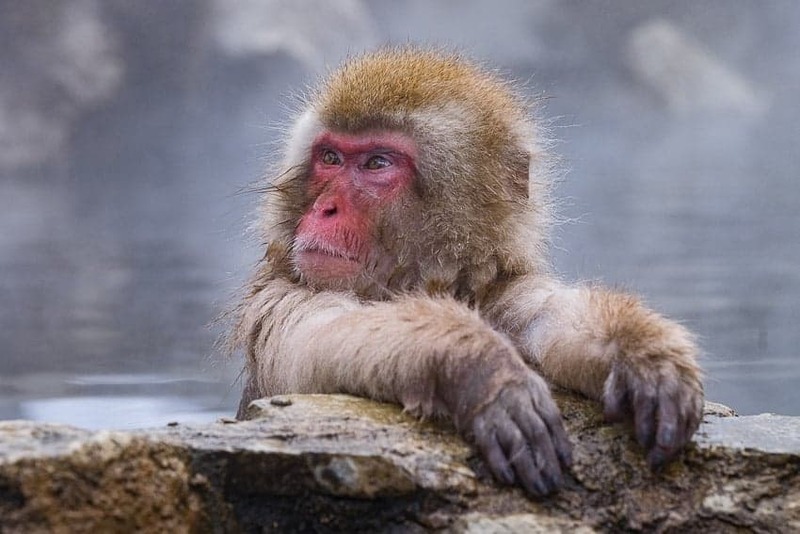 There are really two shots to get at the snow monkey park: (1) You'll want a decently long lens to shoot the monkeys bathing in the main hot pool. There is a rail around the pool, so the ideal focal length is probably 150mm to 300mm on a full frame camera. I only had a 70-200mm and it was just slightly too short for some shots. 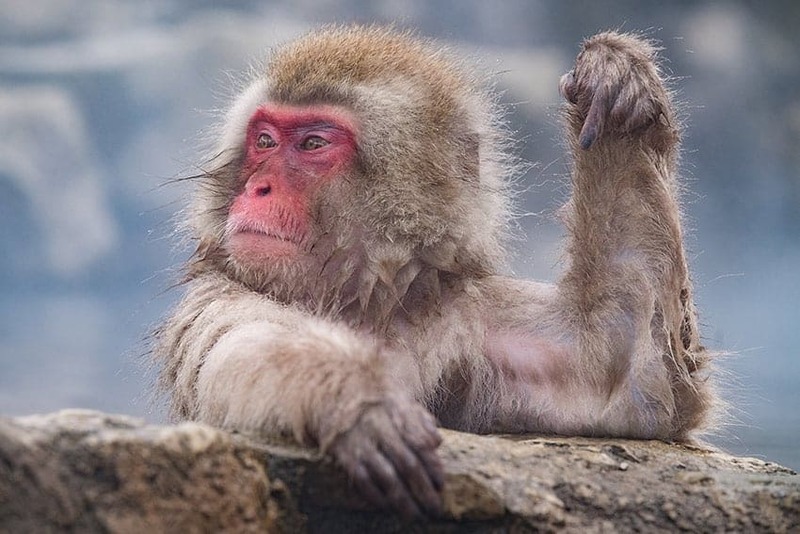 I made the mistake of planning my lens choices by going on 500px and looking to see what focal length other photographers used for their snow monkey shots. I determined that about 55 mmm was the most common focal length. Then I got here and wondered why since I was wanting about 250mm most of the time. Then I realized that 55mm is the most common because so many people have DSLRs with only an 18-55mm lens. Whoops. But my 70-200 was totally fine and I got lots of good shots. Just for the main pool it would have been nice for a TINY bit more reach. At the same time, you will have monkeys come up and brush against your pant legs as they walk by. The monkeys are not at all afraid of humans. The only reason for the longer focal length is when they are in the main hot pool and you have to stand behind the railing. You'll also want a wide lens, though. One of the coolest shots of the snow monkeys is to put the camera right up next to them and get a wide angle perspective of the monkey bathing in the pool. For this, a 24-70 is perfect! I even shot one with my iPhone (33mm equivalent focal length). Anyway, the easiest way to get to the Snow Monkey Park from Nagano is to go into the tourist information center in the Nagano train station. It's a decent size store operated by the city that helps foreigners get around and know what interesting things can be found in Nagano. They speak English. In the tourist information center, they'll give you a bus schedule and also a ticket that gives you a discount to get the bus fare and entrance to the park in one pass. If I remember right, we paid under $15 USD to get the bus and entrance to the park. But you'll need to time your departure and arrival. The bus only goes every two hours during the winter, and only comes back every two hours. So it's wise to get the schedule first thing in the morning or the day before so you can plan your day. The bus takes you to the bottom of the hill. You'll walk a quarter mile to the restaurant and gift shop at the start of the trailhead. Then, it's about a 35 minute walk in to the snow monkeys. The hike does gain quite a bit of elevation, but it's a very well groomed trail without any particularly steep parts. The trouble is traversing the path through the snow and ice which can cause you to slip. I made the hike in 35 minutes (each way) with my 7 year-old son. If I were by myself I could probably have done it in 20. He was tired by the end and I had fallen to the ground twice, but we made it just fine. As long as you don't have balance issues or serious problems getting around, you should be fine. My 7 year-old made it without issue. It is definitely possible to drive here in Japan and rent a car. The traffic seems moderate during the winter and at least half of the signs are in English and Japanese. But it was too much of a risk for me. Driving in a foreign country is always very stressful and I wanted this trip to be fun and easy. This was the most disappointing part about the trip. After shooting the snow monkeys on the first day, I still had several days to shoot but there really weren't any interesting locations I could find in Nagano. There are lots of little street photos to be made and tourist shots of the temples, but if you are an advanced photographer who is really just hunting down the epic shot, then it may be a bit disappointing. I wish I had planned the trip to just stay two days in Nagano and then head down to Kyoto where there appear to be more shooting opportunities during the winter. During the spring when the blossoms are out, there are lots of cool locations to shoot throughout Japan, but during the winter the options are a bit more limited. You can actually stay right at the snow monkey park. There's a resort there. But then you'd be up in the mountains with nothing BUT monkeys all around you. 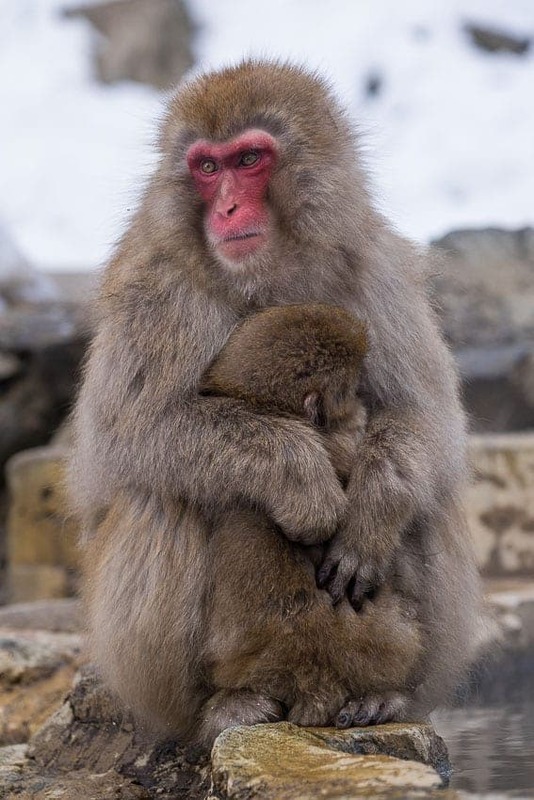 The snow monkey park is quite a distance (30 minute drive) from the city of Nagano. I think most travelers will prefer to stay in Nagano and travel to visit the snow monkeys. In Nagano, I think you have a huge advantage if you find a hotel very near to the train station. I stayed at the Chisun Grande hotel in Nagano and found it to be very clean and westerner friendly. They had relatively normal beds for a westerner and the room size is much bigger than most Japanese hotels. The Zenkoji temple is the coolest thing in Nagano next to the snow monkeys. It's a huge temple with many buildings and monks doing their work. There is a lot to do just in the temple courtyard, but if you go in the actual temple, you have to take off your shoes and pay a small entrance fee. You walk into an underground tunnel that represents hell. It's absolute pitch black as you keep your right hand touching the wall and follow through a labyrinth of turns while you can't see even your hand in front of your face. At the end of the tunnel you touch a lock that represents passage into heaven and then you see the light coming from above which is your passageway (stairs) out. It's actually a pretty neat experience. The best tip I've found for traveling and not losing a ton of money in currency conversions is to get foreign currency from your local bank before traveling. Improve Photography banks with Wells Fargo (which we hate, by the way. They have a million policies that do nothing but annoy customers. I much prefer my bank for my personal account–USAA. Woah. I just went off on a tangent. Back to the monkeys). Anyway, go to your local bank before you leave and ask to order foreign currency. You can order anything. I always order about $700 of foreign currency before I travel. Then, when you come home you can exchange the foreign currency you have left for dollars. Wells Fargo does this for little or no charge. Much better than the foreign ATM fees and getting taken for a ride from the money exchangers at the airport. I made the mistake of getting on a city bus without breaking down the bills I got from the ATM. They require exact change and you pay when you get OFF the bus (not as you get on). Anyway, I only had a 10,000 yen note (about $80 at the time of writing). Fortunately, the bus driver was super nice and he let us off without paying, but I almost took an $80 bus ride for 3 blocks. So be sure to have lots of change. Very few stores took a debit or credit card. Almost everywhere required cash. So plan on that before you go. I got the Japanese style buffet in my hotel the first morning thinking I wanted an authentic experience. On the menu was pickled beets and fermented asparagus. I found the best bet was to eat at convenience stores where I could pick out the packaged food instead of going into a restaurant and ordering blind. The convenience stores have the DELICIOUS white steamed rolls with meat inside them. They are usually hot in a little warming thing right next to the register. In Hawaii, we called these manapua. No idea what the Japanese called them. The white ones have beef (good), the orange one has curry (okay), the yellow rolls have something delicious in them, the green are terrible, and the pink ones are dessert. Excellent. Japanese sleep on “futons.” They are extremely hard mats on the ground with hard pillows to match. If you can stand in the middle of the hotel room and touch all four walls, you've been given a rather large and spacious room. Take some time to read reviews of your hotel from people from your country so you can get an idea of whether or not you'll be able to sleep. Americans (and I'm one of us) have the worst toilets in the world. Okay, not the worst. That prize goes to the Chinese. But Americans have very dull and unenlightened toilets. The Japanese have awesome toilets. I went to a public restroom yesterday and it had a heated seat, a noise maker so others can't hear you doing your business, a bidet for the back, a bidet for the front (for the ladies), a blow dryer for your rear, you could adjust both the pressure and the water flow of the bidet, and it played MUSIC!!! Seriously, I want to rip one of these out of the bathroom, shove it into my suitcase, and bring it home with me. I'll hate going to the bathroom for the rest of my life in America.